Spier Wine Farm is a traveller’s destination of note… and if you think that makes it in any way ‘commercialised’, you are gravely mistaken. Spier is known for its amazing experiences – everything from Eagle Encounters to Segway tours – but it is also a place where Cape beauty, interesting art and good food come together. After exploring almost every inch of the farm and engaging with some majestic birds, we made our way over to the charming Spier Farm Kitchen. 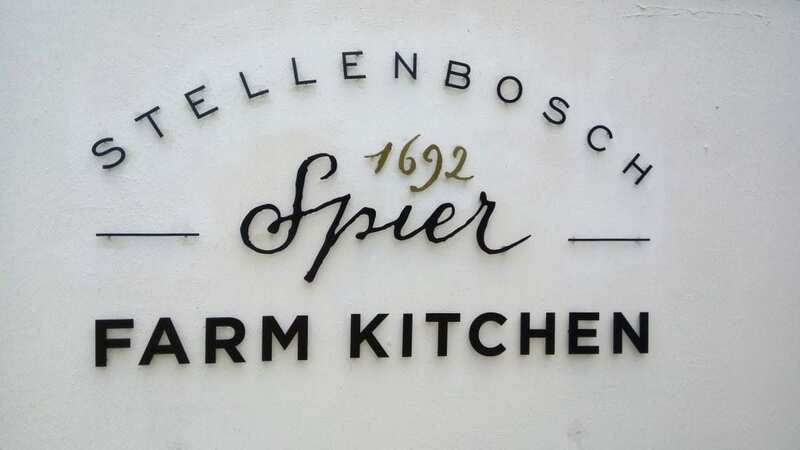 The Spier Farm Kitchen is where picnic baskets can be collected from 12:00 pm – 14:00 pm and returned to by 16:30 pm. 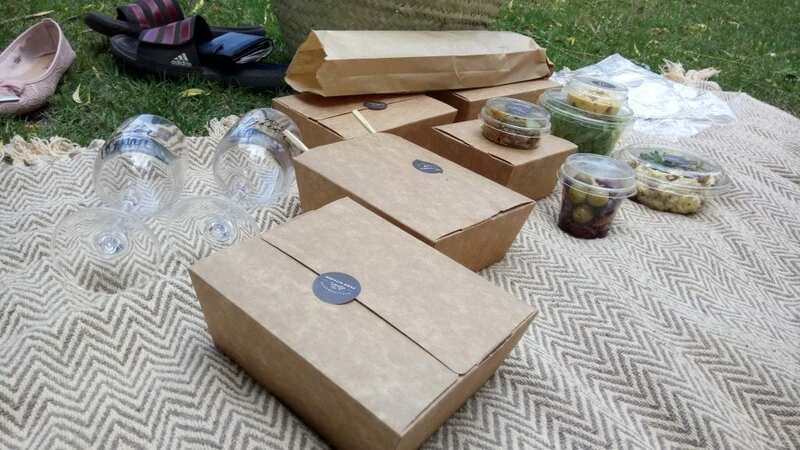 Spier picnics must be booked before noon (a day in advance) in order to ensure that they are ready for collection the following day. Spier’s seasonal or vegetarian picnics (they also offer a Children’s picnic for R150) strive to use locally produced, organic and naturally fresh ingredients and goods, making them healthy, as well as super tasty. With this in mind, private picnics brought from home are strictly prohibited and no outside drinks or food are allowed. 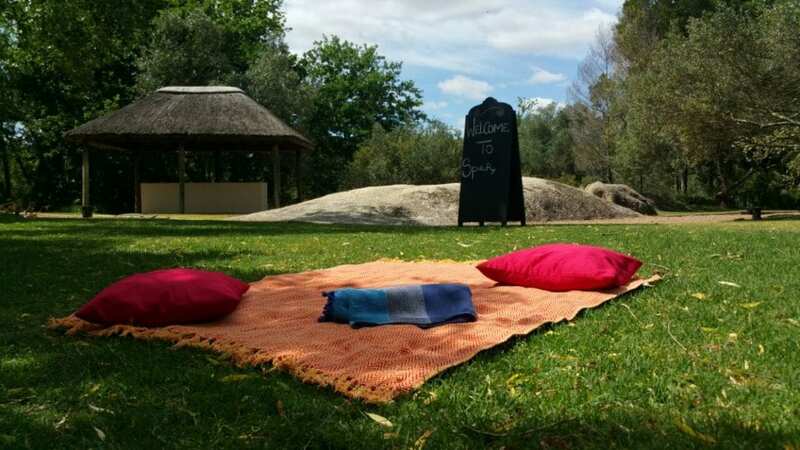 All of Spier’s ample picnic spots are completely public and work on a first come, first serve kind of basis. However, that said, they do accommodate group bookings in semi-private spots, if booked in advance. Please note: Debit cards are not accepted. Please present your receipt before 16:30 pm to qualify for your refunds. 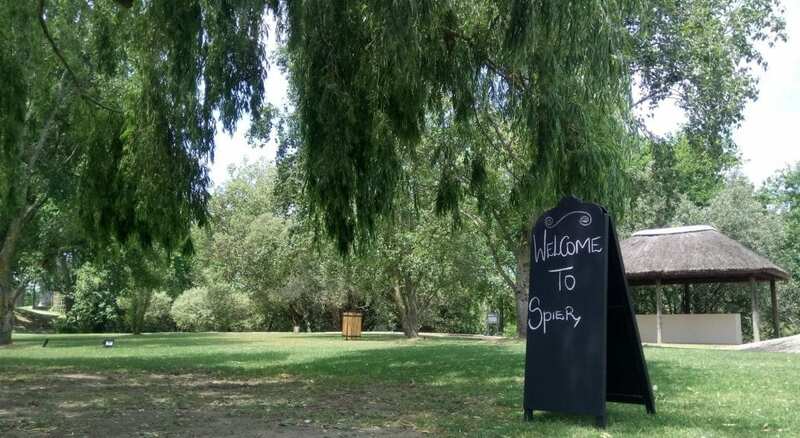 Spier is one of the most beautiful wine farms you’ll find anywhere, so you’re really spoilt for choice on where to perch down to enjoy your picnic. We had a secluded spot behind the dam, but there are plenty of benches and grassy oasises to enjoy your picnic at. The dam and rolling lawns make for the most wonderful backdrop – second only to the distant Helderberg mountains. 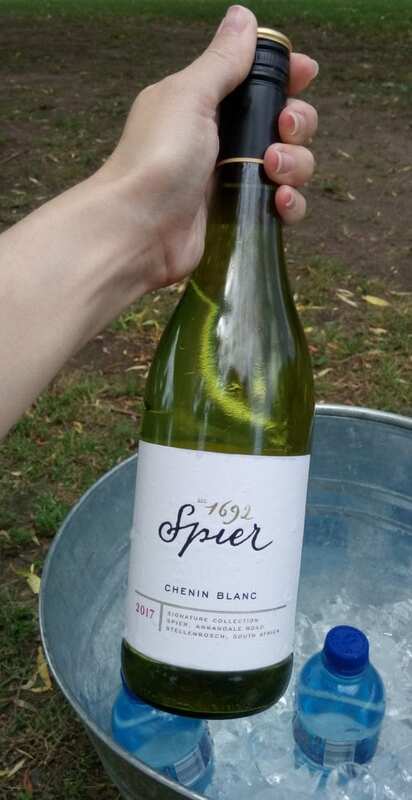 For our picnic, we opted for the Spring Picnic basket, choosing the Spier Signature Chenin Blanc 2017 (we also each had a bottle of Still spring water). “Crispy wood-fired baguette, farm cheeses and preserves, smoked trout quiche and a sumptuous milk tart and koeksisters for desert.” Bottle of signature Spier wine is included in the price. Cost: R580 for two; additional person(s) is R290 p/p. Our chosen bottle of Spier Signature wine. 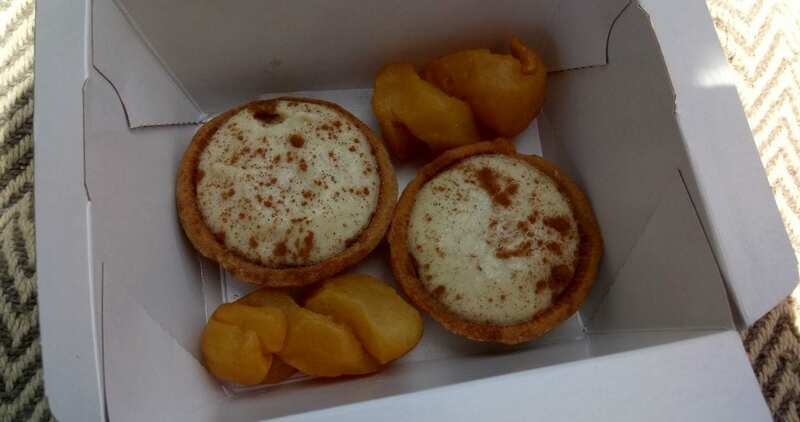 In what is a rare instance, literally everything inside our overflowing picnic basket was delicious, providing a good selection of sweet and savoury. Our picnic really impressed me in how wonderfully put together it was and the full set-up was ultra-slick. We were starving when we sat down and by the time we got to the end of our picnic, our tummies were full and contented, with barely any space for more. 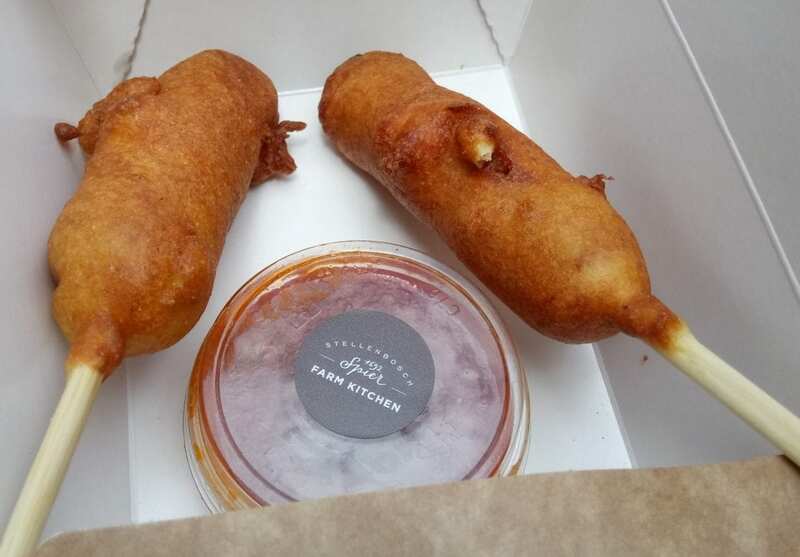 Farmer Angus beef corn-dog with spiced tomato ketchup (both so, so good but the spicy tomato ketchup has a kick to it, which I loved). My boyfriend ate most of the garden salad (simply because I was too full by then) and he really liked it. 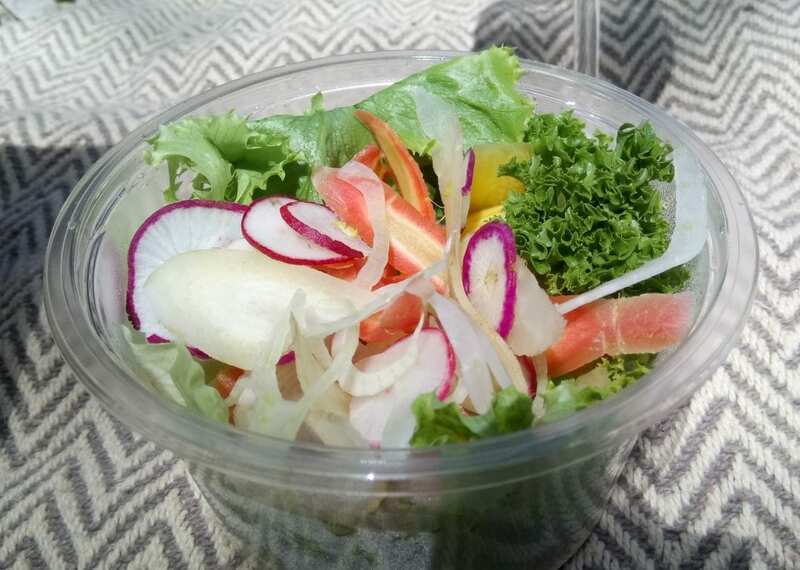 It was a well-presented, colourful and fresh salad! Our Spier Signature Chenin Blanc, meanwhile, was really lovely. It was my perfect kind of light, fruity, yet still punchy, wine and my boyfriend – who’s not a huge wine drinker – seemed to really enjoy it too. Overall, I think it’s an ideal wine for both wine lovers and those who haven’t fully acquired a love of wine. 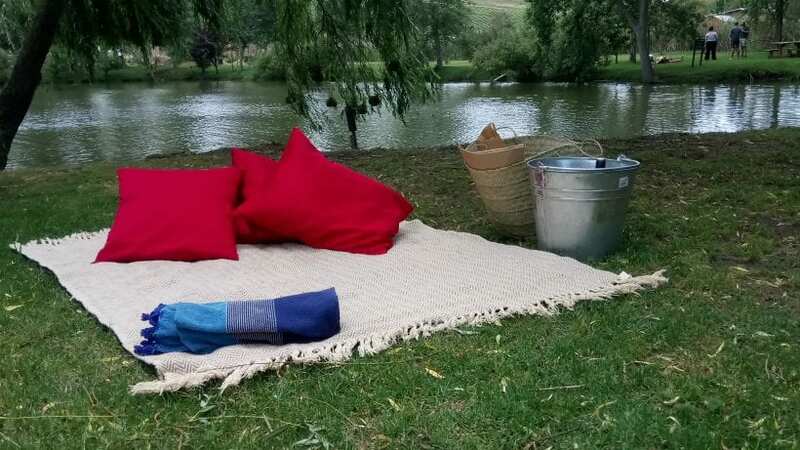 Our whole experience was comfortable (we had the full works: cushions, blankets, ice bucket and basket! ), romantic (though it would be a special experience to share with a parent or close friend too) and highly enjoyable! 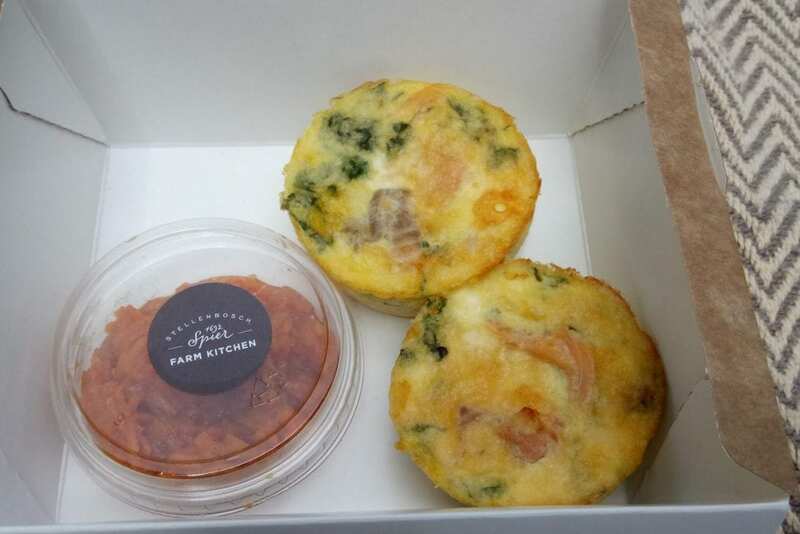 Excellent service, friendly staff and a welcoming environment at the Farm Kitchen. A delicious, well-compiled picnic basket, able to suit all tastes. A wonderful selection of Signature Spier wine to choose from. Comfortable, elegant Spier cushions and blankets (available for loan on the day). 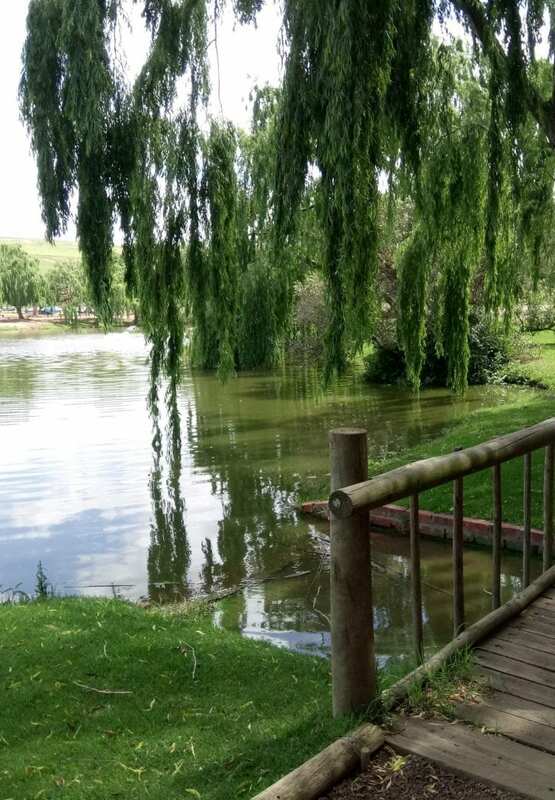 Stunning picnic spots, with ample space for you to lounge about; let kids play or run around or simply to just sit and enjoy the tranquil farm atmosphere while you eat. Gorgeous natural backdrops, in the rolling lawns, majestic mountains, cool boulders and picturesque farm dam. 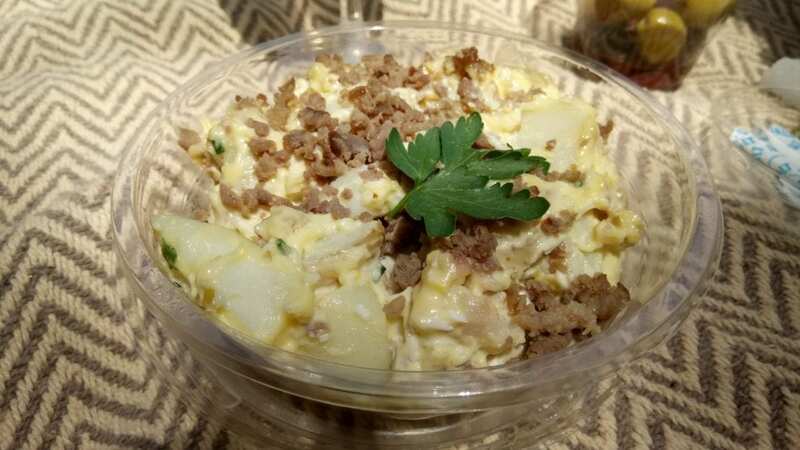 A good, value-for-money picnic offering, especially considering how satisfying and filling it was. Thank you very much to Spier Wine Farm for such a stunning picnic experience! We loved every minute of our time with you and will surely visit again soon in the coming months. 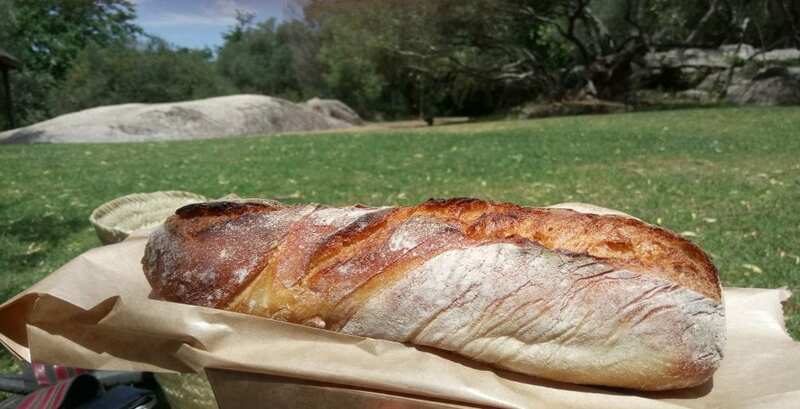 For more information on Spier Wine Farm and its wonderful farm picnics, please contact: Spier Farm Kitchen (021) 809 1172 or email them at: info@spier.co.za. You can also visit their website or find them for yourself at Spier Wine Farm, Baden Powell Drive (R310), Stellenbosch, Western Cape, South Africa. 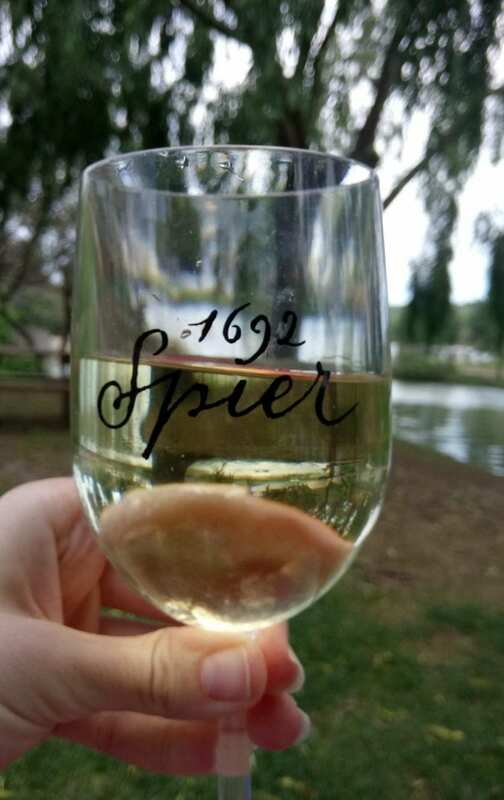 Spier Wine Farm is also on all leading social media platforms, so be sure to connect with and follow them on Facebook, Instagram and Twitter.